The holiday spirit is definitely wafting through our kitchen! With a blanket of fresh snow on the ground, it definitely feels more like the holidays. And in my kitchen, I love the warmth my oven is giving off after baking a few batches of cookies! Speaking of cookies, it's Cookie Day #4 of our holiday countdown. Today, I'm highlighting these White Chocolate Cheesecake Cookies that were made by my friend, Katie. These pillows of sweetness are easy to make with only a few add-ins to your favorite sugar cookie recipe! 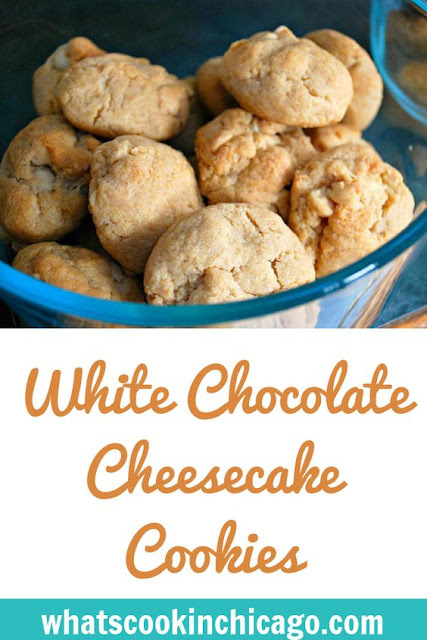 These cookies are packed with cheesecake flavor! The combination of both cheesecake pudding and cream cheese also make these especially soft while maintaining their shape. You can also put on your own spin on these cookies but adding in chopped pistachios and dried cranberries for a pop of festive color too! Preheat oven to 375 degrees and line baking sheet with parchment. In a large bowl, combine cookie mix, ingredients needed for cookie mix per package directions, pudding mix, chocolate chips, cake spice mix and cream cheese. Once well combined, form dough into 1 inch balls and place on prepared baking sheet. 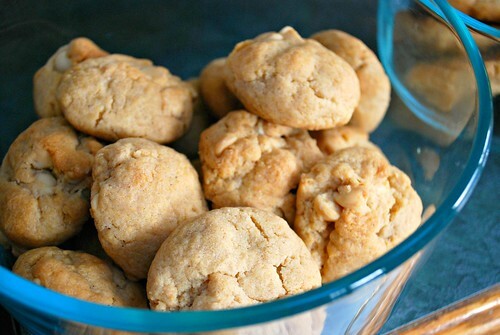 Bake cookies in preheated oven for 10-13 minutes or until lightly browned on edges.